Click to listen to episode (4:47). Except as otherwise noted, all Web addresses mentioned were functional as of 11-30-18. From the Cumberland Gap to the Atlantic Ocean, this is Virginia Water Radio for the week of December 3, 2018. This week, that excerpt of “Hiking in the Highland Firs,” by Timothy Seaman of Williamsburg, Va., opens an episode on a tree structure that’s prominent during wintertime in temperate climate zones, like that of Virginia. Have a listen for about 15 seconds to some of the weather that trees endure during a Virginia winter, and see if you can guess this structure. And here’s a hint: if you don’t know this, you might ask a buddy. If you guessed tree buds, you’re right! Buds are one of woody plants’ adaptations for surviving winter’s cold temperatures, drying conditions, and damaging winds. Buds contain meristematic tissue, the tissue that will be future growing stems or flowers. Sometimes woody plant buds include only the meristematic tissue, but more typically that tissue is covered by small, folded leaves and modified leaf structures called bud scales. 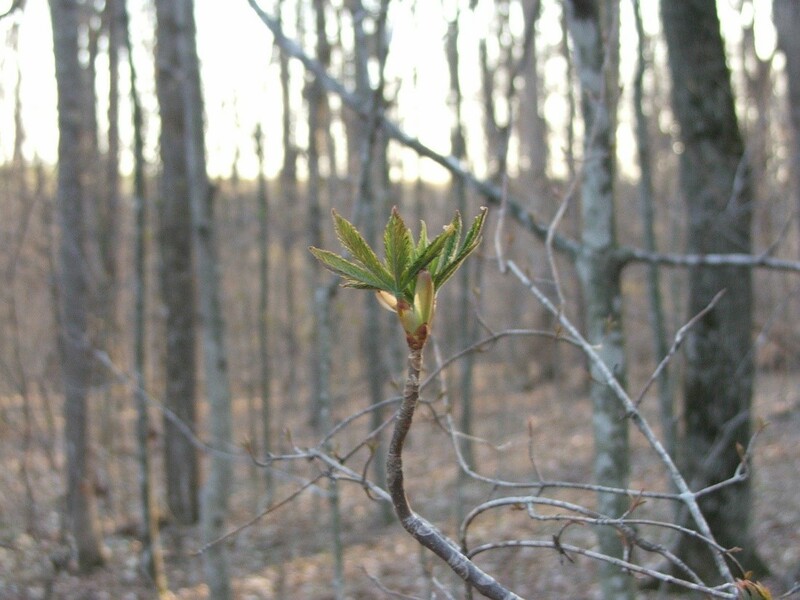 Just like a tree’s leaves, buds have distinctive shapes and colors, allowing tree identification when leaves are gone. Flowering trees form both vegetative and flower buds. 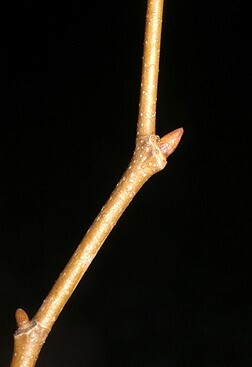 The vegetative buds can be at the end of twigs or along the length of twigs in the axils where leaves attach. Flower buds may look very different from vegetative buds, for example, as in the Flowering Dogwood. Various other kinds of buds can occur, as well. 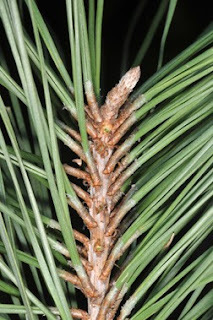 Non-flowering trees—that is, conifers, the cone-bearing trees, such as pines, spruces, and firs—also have vegetative buds that can develop into stems or into cones. In temperate climates, buds typically form at some point during the growing season and then become dormant—that is, stop actively growing—during the winter. 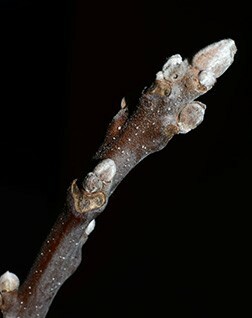 In spring, in response to hormones and environmental conditions, bud dormancy ends as the buds open and the enclosed tissues begin developing and growing. But there’s much variation among species, and even among individuals within a species, in patterns and timing of bud formation, dormancy, and activity. Now, what makes woody plant buds particularly a water story? Here are three answers to that question. First, the availability of water during bud formation in one year can affect how much tissue is stored in the bud for growth and development the following spring. 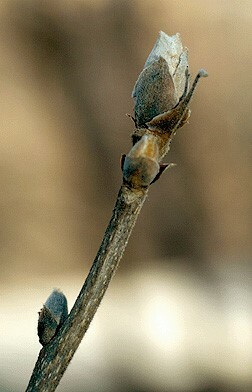 Second, the meristematic tissue in a bud is protected from drying out by the covering bud scales and undeveloped leaves. And third, while buds don’t protect plant cells from freezing, their role in preventing dehydration contributes to the plant’s ability to withstand injury from freezing temperatures. As winter covers Virginia, some of the history—and water—of last summer, along with the future of next spring are already folded into the buds of the Commonwealth’s trees. “Hiking in the Highland Firs,” from the 2001 album “Common Wealth,” is copyright by Timothy Seaman and Pine Wind Music, used with permission. More information about Timothy is available online at http://www.timothyseaman.com/. “Hiking in the Highland Firs,” written in honor of Virginia’s Grayson Highlands State Park, was previously featured in Virginia Water Radio Episode 320, 6-13-16, on Virginia’s state parks. The sound of wind in oak leaves was recorded by Virginia Water Radio in Blacksburg, Va., on March 15, 2013. Virginia Water Radio thanks Jen Gagnon, John Peterson, and John Seiler, all of the Virginia Tech Department of Forest Resources and Environmental Conservation, for their help with this episode. Yellow Buckeye leaves in an opening bud in Blacksburg, Va., April 1, 2010. 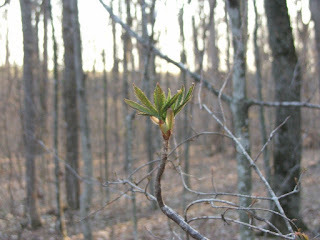 The four photos below, all of buds of native Virginia trees, are courtesy of the Virginia Tech Department of Forest Resources and Environmental Conservation, “Dendrology Fact Sheets,” online at http://dendro.cnre.vt.edu/dendrology/factsheets.cfm. Paul J. Kramer and Theodore T. Kozlowski, Physiology of Woody Plants, Academic Press, New York, 1979. Texas A&M University AgriLife Extension, “How Trees Grow,” online at https://agrilife.org/treecarekit/introduction-to-tree-care/how-trees-grow/. University of California-Davis/Fruit and Nut Research and Information Center, “Vegetative and Floral Tissue Development,” online at http://fruitandnuteducation.ucdavis.edu/generaltopics/AnatomyPollination/VegetativeFloral_Development/. Sanglin Lee and Alan Raflo, “An Introduction to Trees in Virginia and Their Connections to Water,” Virginia Water Resources Research Center, December 2011; available online from the Virginia Water Central News Grouper, at http://vawatercentralnewsgrouper.wordpress.com/2011/12/07/an-introduction-to-trees-in-virginia-and-their-connections-to-water/. T.J. Brandeis et al., “Forests of Virginia 2012,” U.S. Forest Service, published 2017, online at https://www.fs.usda.gov/treesearch/pubs/54555. Virginia Tech Department of Forest Resources and Environmental Conservation, “VTree,” online at http://dendro.cnre.vt.edu/dendrology/index.html. This is the Web site for the dendrology course by Dr. John Seiler in Virginia Tech’s Department of Forest Resources and Environmental Conservation. It offers identification keys and fact sheets to trees and other woody plants throughout North America. This site also has links to download the VTree Mobile App. Virginia Department of Forestry, “Virginia’s Forests,” online at http://dof.virginia.gov/stateforest/index.htm; and “Forest Facts,” online at http://dof.virginia.gov/stateforest/facts/index.htm. All Water Radio episodes are listed by category at the Index link above (http://www.virginiawaterradio.org/p/index.html). See particularly the “Plants” subject category. Following are links to some other episodes relevant to trees or shrubs. Ash trees – Episode 376, 7/10/17. Flora of Virginia – Episode 354, 2/6/17. Forestry – Episode 160, 5/6/13. Maple trees – Episode 84, 10/17/11. Rhododendrons – Episode 216, 6/2/14. Sycamores – Episode 176, 8/26/13. Tree colors and changes in fall – Episode 285, 10/9/15. Tree structures for water movement – Episode 285, 10/9/15. Trees' human and ecological benefits – Episode 153, 3/18/13. Witch Hazel – Episode 238, 10/31/14. 3.8 – Basic patterns and cycles in nature. 4.9 – Va. natural resources, including watersheds, water resources, and organisms. 4.4 – basic plant anatomy and processes. 5.5 – cell structures and functions, organism classification, and organism traits. LS.3 – cellular organization, including cells, tissues, organs, and organ systems. LS.4 – organisms’ classification based on features. BIO.8 – dynamic equilibria and interactions within populations, communities, and ecosystems; including nutrient cycling, succession, effects of natural events and human activities, and analysis of the flora, fauna, and microorganisms of Virginia ecosystems. Episode 407 (2-12-18) – on snow chemistry and physics, for high school.